I write this cold weather post with trepidation, fearing the age-old "jinx" even though I'm a self-proclaimed non-believer when it comes to superstition. I'm a walking paradox when it comes to these things, it's true. Exactly what I don't want to jinx is the return of last week's autumnal heat wave - although the weather forecast is looking like there might be some warmth in the next few days. It's currently gloomy af though, (that's the scientific measurement for the amount of gloom) and I can finally whole-heartedly browse through cold-weather necessities for the season. Not that it's very cold yet but THE GLOOM ya know? But I digress...I've rounded up some of styles to look forward to, and some cool sweater silhouettes for the non-vest-involving layering in our future. One thing that I have been enjoying seeing in sweaters lately is details in the wrists and / or neckline. This is great for layering under slips, jumpsuits, and overalls or adding a little something to peek out from under coat sleeves. 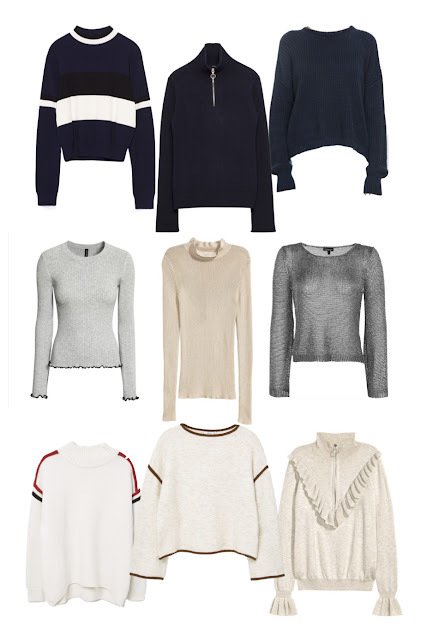 Pullover sweaters are amazing for keeping in your bag and throwing over tees on days with uncertain levels of chill. Pick one with sporty stripes or a long zipper for a bit of effortless cool - added bonus if your pair it with slides or ankle boots a la Camille Rowe. Put down the flannel shirt and puffer vest I say!